So I figured out that if the weather is nice I do not like staying inside and doing artwork! Therefore I've had nothing really blogworthy to post. School has started again and for the past three to four weeks I have been busy with that. But now I seem to have hit my stride so it's time to give myself a kick in the pants to get creative again! 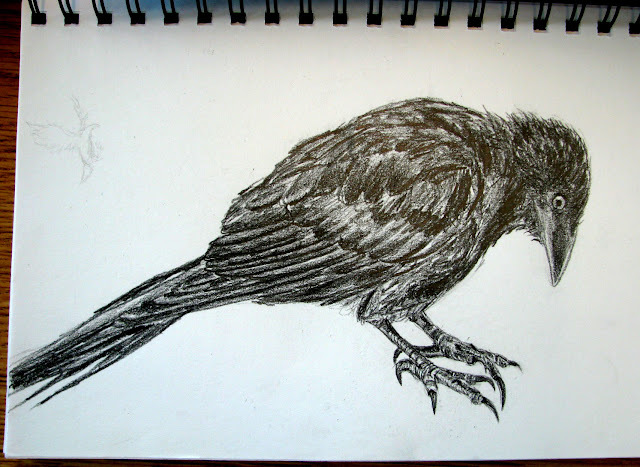 Since fall is coming I have felt like drawing crows. Not really sure why they remind me of fall but I didn't feel like drawing cute sparrows and fluffy robin chicks anymore. Crows are more moody and mysterious don't you think? I do have other projects started but not finished yet so I will have more to post soon. I'm still a little scattered. But today is another gorgeous day out so I am going to go enjoy it while I can. Kerri- I have been tossing around the idea of doing a drawing video tutorial for my students but maybe I'll try it out here first! Tracy- the feet were the last thing I drew and I was surprised by how much personality they gave to the image.